Anna focuses her passion for craftsmanship on creating collections of fine jewellery that speaks simultaneously of delicacy and strength. The process of making, the intimate nature of jewellery and the feel of the final piece are all integral to her work. Smooth sheet metal is transformed into textured organic shapes; articulated and layered together to form flowing pieces that sit sensually against the skin and celebrates the movement of the body. The ancient technique of Keum-Boo is used to apply rich gold tones beside shimmering silver, creating compositions of colour and texture, light and shadow. The addition of gemstones and diamonds give spark and movement to the more discreet pieces, accentuating and highlighting their quiet beauty. Each piece is a little labour of love, made to be loved. The meaningful connection jewellery has with people is an integral part of its appeal for Anna. Not only in it’s very immediate physical relationship with the wearer but also in its long history of association with relationships between people. Jewellery is often used as tokens of love and commitment, as expressions of identity and belonging or used as markers of meaningful or milestone occasions in life. To be part of a larger story is an honour and a joy. Anna initially studied Jewellery Design at Middlesex University where a strong emphasis was placed on materials and experimentation, leading to her playful and intuitive way of designing. Anna then went on to spend a year at the renowned Bishopsland workshops where she refined and focused her craft. Upon moving back to London she worked for some great names in the jewellery and silversmithing world, such as Jane Adam, Ane Christensen and Susan May, whilst simultaneously setting up her own business. 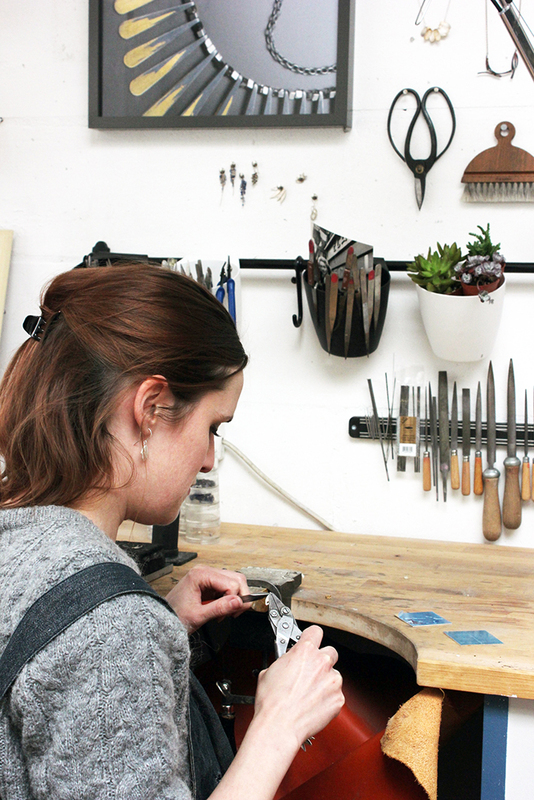 In 2014 she moved to Cockpit Arts where she has established her practice, selling at prestigious galleries throughout the UK and regularly featuring in major exhibitions such as The Goldsmiths’ Fair.